One might think, by my title, that I’m referring to one uber-cheesey chick flick (which I have not seen). One would be wrong. 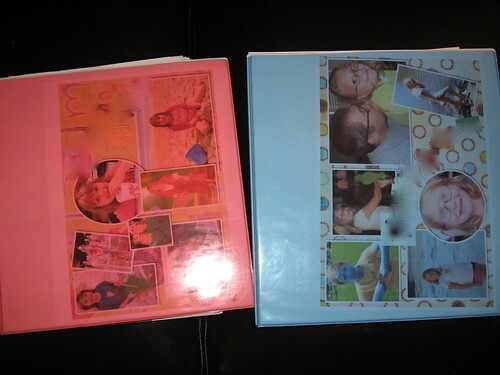 Instead, I’m referring to the notebooks I made for each of my kids for this school year. And I wouldn’t even bother posting about them except that I’ve been asked to expound on what the heck I’m talking about by a couple of real-life friends and I figured if I was going to explain it all, I might as well just Explain It All. To you, too. As Maddie is a 5th grader this year and Millie is officially of proper kindergarten age I did the only thing any self-respecting homeschool mama would do. I panicked. For a bit. Just a teensy tiny bit. And then I started thinking. 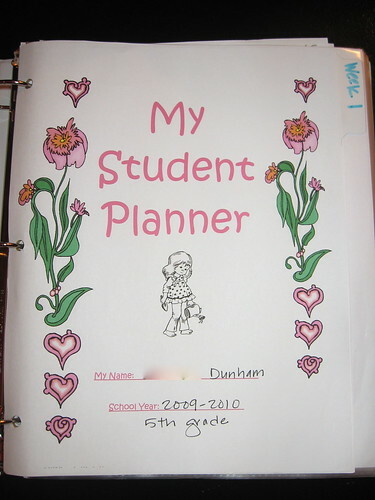 Last May I heard of another friend who makes assignment notebooks for her kids. That’s all I know about it. I kept meaning to go over to her house and take a look at what she meant by that but it never happened, so after ruminating on the idea of “individual assignment notebooks” for three months, I came up with what I think will be a pretty workable solution for us this year. But we have only just completed day two of our homeschool year, so ask me again in five weeks, you know what I’m saying? First off, and on the recommendation of another friend who ordered this without seeing it yet, I, too, got myself a copy of The Well Planned Day. Because I’m crazy like that. I did a sketch of this, including all the Sonlight reading and specific math lessons and basics on everything else for the first ten weeks of school. The covers were designed on Scrapblog. They have one for boys too. And also a combo pack in case you are one of those strange types who have children of both genders. We don’t know anything about that. So, from here you see that tab marked “Week 1”? I made 10 of those. Now, putting 10 weeks worth of assignments in one binder proved to be too much, so I had to break out some basic black binders for the extra 5 weeks. I marked those “_____’s Upcoming Work”. 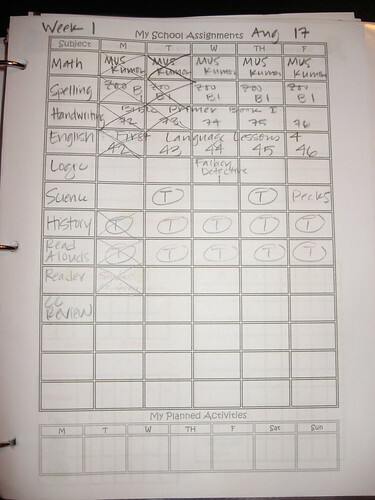 With this sheet I actually penciled in the subject column and certain things on the daily boxes that I knew wouldn’t change from week to week. 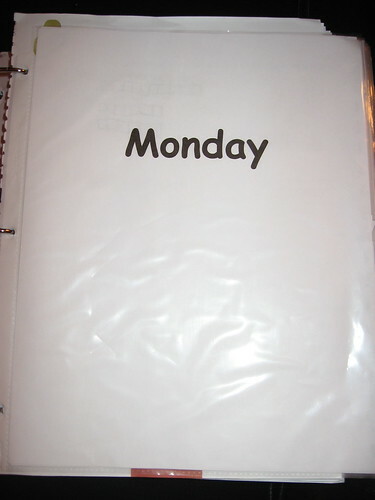 I made copies of that page so I wouldn’t be writing those same things over and over and over. I got this brilliant idea after I had done just that about four times. I learn the hard way. I didn’t make the specific chores permanent. I figured I wanted wiggle room to change them periodically or add to them here and there. But this way each girl has a very clear outline of what I expect them to do each and every single day. You might have noticed the circled “T”s in certain boxes of the individual sheets. I put those there because I wanted the girls to understand they still had to do those things on that day, but the “T” is for “together” and it is something we will all do as a group. The together stuff is outlined better in my notebook, not theirs (see my planner above). So far, this system is really working well for us. But I did mention that we’ve only done two official days of school, right? I also seriously feel the need to mention that this is the plan I made that I think will work for me and my family this year. It very well may not be the plan that will work at all for yours. Okay, I feel better now, having gotten that off my conscience. Homeschooling mamas can be pretty bad about looking at what someone else is doing and panicking that it’s not what they are doing. Conversely, homeschooling mamas can also be pretty bad about looking at what someone else is doing and critiquing it to the death. Funny thing about that, though. Somehow, I don’t think that trait is unique to homeschooling mamas. But I digress. I haven’t posted anything about this recently but we do assignment sheets in our family, too. 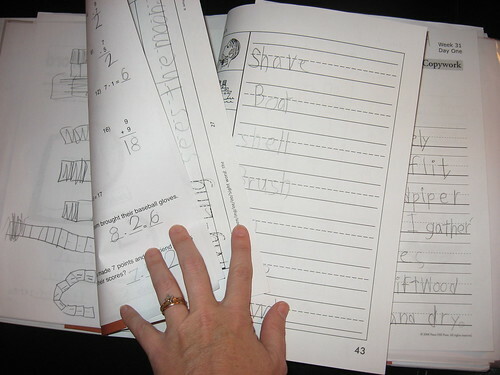 It “revolutionized” the way we homeschool. My husband and I were going crazy after hearing-“I’m done” a million times a day. When we went to assignment sheets, everybody knows what they are doing, even Dad, if by chance I need to go to the bathroom or something (we all have to go sometimes, right?) Anyway, thanks for posting, I’ll have to check the planners out on currclick. I’m a lurker by the way. I’ve enjoyed reading your blog for sometime now. Good luck with your new school year. Those are great notebooks. Definitely not a cheesy chick flick. Oh my word, I need a nap after seeing those. You are so organized! It looks like a great system. 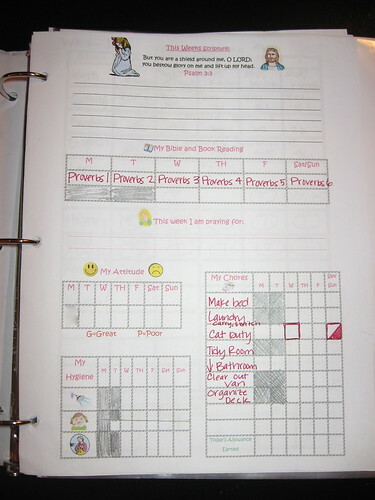 I am using google calender this year to make each child’s schedule (ages 12 & 10). I print it the beginning of the week, as well as one for myself. 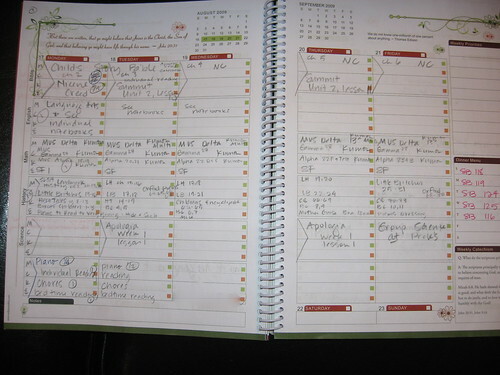 The calender includes school assignments, chores, hygiene, and free time. So far it’s working for us but we’ve only been using it three days. I hope you get into a workable groove for your family soon, but do give yourself the time you need to feel your way into it. It requires a very steep learning curve on your part. Hang in there! MEGAN!!!!! i can’t even contemplate your post because of the beginning statement…YOU’VE NEVER SEEN THE NOTEBOOK!!!!! GIRL!!! YOU HAFTA SEE IT…i think it says so in the back of my bible…really! i wrote it in pink sharpie and then sprayed it with pink perfume!!!! grab your favorite beverage and pretend you’re twenty and watch it!!!!! !